i think that the top region should be worth more because it has the most territories (5). I know it only has 2 bordering territories, but still. I think the other bonuses are fine though. also, if there's going to be a blue border around Luxembourg city, then can you make it more evident on the bottom of it as well? The bonuses are right I think...no need to up them. Glad that you like the new mini map. Even though the top region has the most territories of them all, it is also the easiest to hold so I think the bonus is right. Luxembourg City is technically part of the greater region (light blue) even though it is a standalone territory, that's why the bottom border is not blue. Hmm, the coat of arms would be too small and its details would be lost if used in the mini map. I tried that before posting. I like the way they are set right now. I decided to add the region names to the mini map after all since these could prove helpful while playing the game on the map. Post number 3665! That's quite a lot. The texture would be better if it wasn't so strong. fireedud wrote: The texture would be better if it wasn't so strong. I like the texture as it is. I won't be changing it. The majority of people seem to like it as well. The texture is alright, but the divisions between continents stand out and look more like fault lines than region dividers. AndyDufresne wrote: The texture is alright, but the divisions between continents stand out and look more like fault lines than region dividers. You mean you prefer the regional borders to be like those in the mini map of Version 1.7 without any bevel and embossing? not me. I like the bevel on the region borders. Gives the map a different feel than others. RjBeals wrote: not me. I like the bevel on the region borders. Gives the map a different feel than others. Actually even I like it and think it makes the map different. Hmm. I think I'm going to stick with it Andy if it's not such a big issue? I don't think Andy can come up with a strong enough counter to influence the group it should be changed - but I would love it if he tried! I wouldn't, so don't give him strange ideas. And anyway what group? Barely no one posts in this thread apart from 3 or 4 people! Hehe. Anyway I won't be doing any updates for the time being until this map makes it to the foundry. I am quite happy with the way it looks and don't know what else to add to it. You'll have to keep doing updates (as long as there are good suggestions). Getting into the map foundry doesn't really change anything. You get the same suggestions and the same people, the threads just moved to a different place. And what should I update? I got no further suggestions. I have nothing further to add at the moment and no one suggested anything else. Well this is a perfect example of how DiM's logic is flawed. He would say that this has no support, and therefore no comments, but that doesnt seem true. But dont go on strike, the only real way to get comments is to update. Im sure once a mod checks this over, you will get moved. Kaplowitz wrote: Well this is a perfect example of how DiM's logic is flawed. He would say that this has no support, and therefore no comments, but that doesnt seem true. Haha. I am not going on strike don't worry. I genuinely don't have anything to add to the map at the moment. I am happy with it as it is so I will have to wait for further user comments to develop the map further. Also it doesn't necessarily mean that there is something else to update. Maybe people are happy with it as it is like I am for the time being. In the legend you have written Luxembourg city and its surroundings, is surroundings what it will be called in the XML? If not, you may want to rename it. 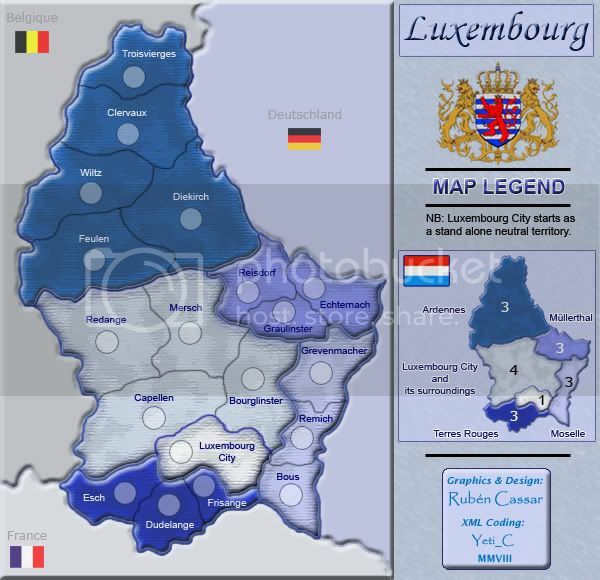 fireedud wrote: In the legend you have written Luxembourg city and its surroundings, is surroundings what it will be called in the XML? If not, you may want to rename it. Thanks but I am not an XML expert so I don't really know what you mean, but I will talk to Yeti about that when the time comes and if there's a problem we'll fix it. I will worry about the XML later, probably the last thing after graphics and gameplay...let's get the idea approved first! How many neutral units should Luxembourg City start with?